"Demian has worked very hard and diligently to provide the best care possible for our property to look its best. He is very prompt and extremely flexible..."
When a customer signs on with Kick Gas Lawn Care, we create a client profile with specific instructions on what the customer expectations are for each and every visit. This is done via a mobile app which allows your profile to be viewed by our staff who are servicing your property. There is no miscommunication or confusion as to what gets done. The customer can, within reason, change or add instructions throughout the season. For example: If a customer painted an outside wall and did not want that area trimmed, to avoid grass ruining the work. They could contact us, and we would instantly make a note in our system to not trim that week. When the employee views your profile before servicing, they will see the note and accommodate. 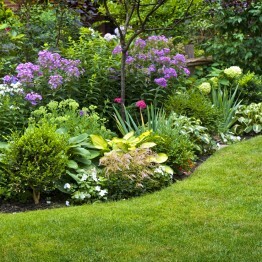 This makes your life easier and allows us to continue providing the best Lawn Care Services in Mississauga. 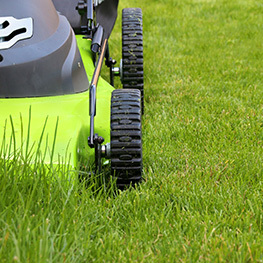 All of our Emission Free Lawn Care equipment is properly maintained to give you the best results. Our Mississauga Grass Cutting Services are second to none. We will cut, trim all edges and clean-up all grass clippings from walkways and the driveway. Our Emission Free Mowing Services can be paired with additional services, to get the best results possible. Estimates are prompt and free, or you can use the estimates we have provided. Just measure your lawn and compare to the square footage with the corresponding price. 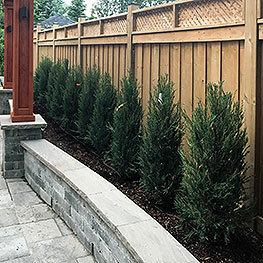 Our Mississauga Landscaping Services are second to none. We will cut, trim all edges and clean-up all grass clippings from walkways and the driveway. Our Emission Free Mowing Services can be paired with additional services, to get the best results possible. Estimates are prompt and free, or you can use the estimates we have provided. Just measure your lawn and compare to the square footage with the corresponding price. 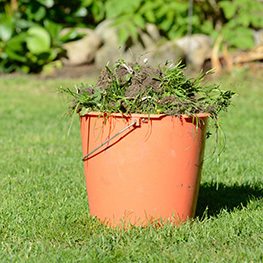 The best, natural method to combat weeds is to manually remove them and strengthen the lawn. Just as weeds can overrun your lawn, your lawn can overrun weeds. Removing the weeds breaks the seeding cycle. Thick healthy grass prevents seeds from establishing and taking root. This service is best followed by top dressing and over-seeding. 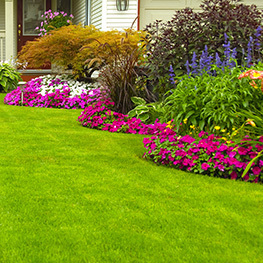 Contact us for your Lawn Maintenance Mississauga needs. Manual, emission-free core aeration. 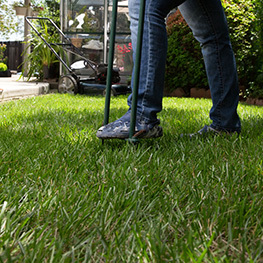 This service is an important part of any Mississauga Lawn Care Program. This process allows the lawn to breath and helps much needed nutrients and water to reach the roots. This service is included in our Organic Lawn Care Programs. $85/Hour for a 2 Man Crew ($42.50 per worker) Please note: approximately 2000-2500 sq feet per hour. Bagging leaves, bundling branches, cleaning garden beds in spring, preparing garden beds for winter and thatch raking. 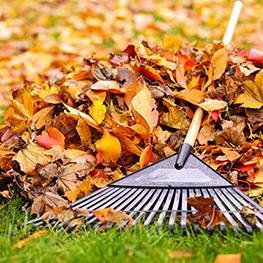 Yard bags can be placed at the curb or just the leaves for vacuuming. We can customize any of these services to meet your needs. You will appreciate our quiet, Emission Free Lawn Care methods in the fall. Bags are free. $85/Hour for a 2 Man Crew ($42.50 per worker). Not composting yet? Turn that kitchen waste into beautiful organic soil. Most Mississauga Lawn Care Companies want to charge you for compost. We want to teach you how to make your own! Every Organic Lawn Care Mississauga Program requires compost. Whether it’s for the grass or the gardens, it’s rich in nutrients and organic matter. The cost is $95+HST. 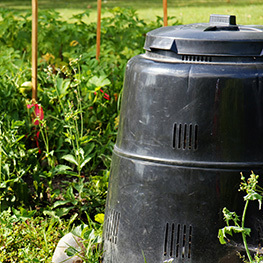 This includes the composter and installation. 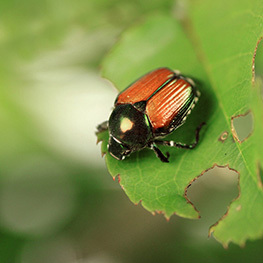 In order to control grubs and Japanese beetles from destroying your lawn we use an all-natural and effective product that is safe for the environment, children and pets. Our Organic Lawn Care Mississauga location can help you control grubs, without harmful chemicals. This is a biological method that is effective and safe. Contact for free estimate. Thatch, grub damage, weeds, high traffic and the harsh winters can have your lawn looking pretty grim. 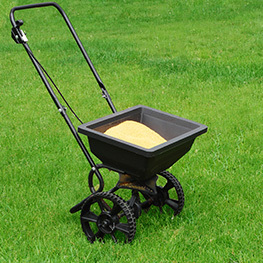 Top dressing and over-seeding is a method used to thicken up the lawn to give it new life. This process is best utilized in the fall but can be done in the spring to repair winter damage. This is an essential service for any Organic Lawn Care Program.